Globe Telecom has finally lowered down the cost of Blackberry services from Php1,200 to Php600, equaling to 50% difference. 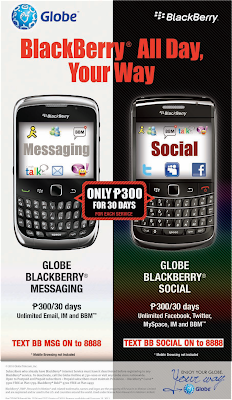 At the recent ad I saw in the newspaper, Globe Telecom is now offering Php300 for 30 days of Unlimited Globe Blackberry Messaging (Email, IM, and BBM) and Php300 for 30 days of Unlimited Globe Blackberry Social (Facebook, Twitter, MySpace, IM, and BBM). What's only lacking with the Social is the Email. Open to both Postpaid and Prepaid subscribers, you just need to text BB MSG On for Unlimited Blackberry Messaging and BB SOCIAL ON for Unlimited Blackberry Social, then send to 8888. A Globe CSR told me that there might be conflict if you subscribe to both services. Also, this is only a promo until January 15 17, 2011. 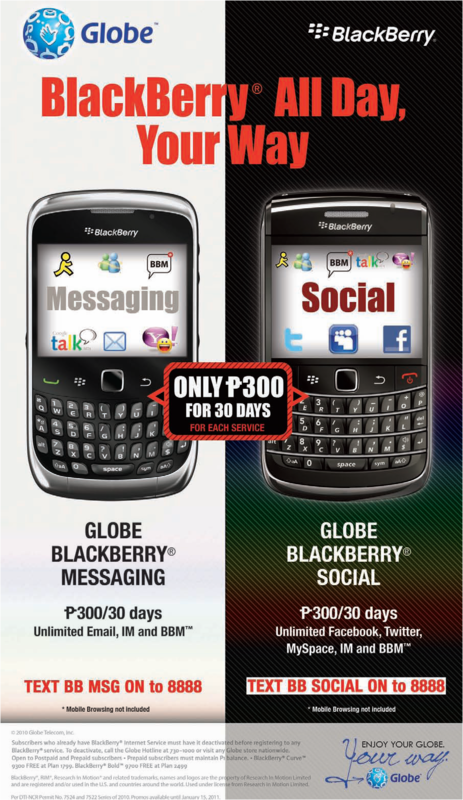 Update: Read the FAQs in the Globe Blackberry Facebook Page. But you can't subscribe to both at the same time, and neither supports foursquare. Hey Glenn, remember I tried this promo? Turns out a lot of subscribers are complaining because their unbilled charges ballooned as high at 15k due to Blackberry fees even if they were on the unlimited 300 service. twitter for Blackberry is not working with BB Social ON. it says "Twitter services are currently unavailable"
Hi Anonymous! Mine works perfectly. It does have some network problems at times, but it should work. I think you'll receive another message that says it's ready for use. I'm not so sure. Try sending a bbm message. If you see a D or R, it's working already. Also, your signal should be capital GPRS or 3G or EDGE - that's the sign that it's already activated.